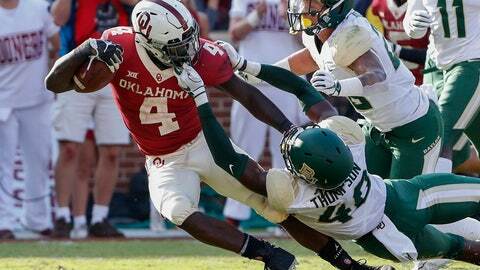 NORMAN, Okla. (AP) — Oklahoma has pieced together a solid running game in Rodney Anderson’s absence. Anderson, one of the nation’s best running backs the second half of last season, suffered a season-ending knee injury against UCLA. In the three games since, the seventh-ranked Sooners have averaged 178.7 yards rushing per game and 5.6 yards per carry. It’s not quite the dominance the Sooners became accustomed to in recent years when Anderson, Samaje Perine and Joe Mixon seemingly plowed through opponents at will. It has been enough to provide balance for quarterback Kyler Murray and keep Oklahoma’s offense among the nation’s most productive heading into Saturday’s game against No. 19 Texas. Trey Sermon is Oklahoma’s rushing leader with 294 yards. The sophomore ran for 74 yards against Iowa State, then a season-high 119 against Army. He’s rushed for just over 1,000 yards in his career. Coach Lincoln Riley hasn’t committed to giving Sermon the primary workload long term. Freshman T.J. Pledger has been playing early in games and Kennedy Brooks had 107 yards and two touchdowns during Saturday’s 66-33 win over Baylor . Murray has helped the Sooners remain productive in the ground game. He ran for 77 yards against Iowa State, 71 yards against Army and 45 against Baylor. He’s second on the team with 285 yards rushing. Brooks has had few opportunities in games because of depth at the position. He has rushed for 158 yards and three touchdowns on just 12 carries this season. Gundy said the blocking still has room to improve. Most of Oklahoma’s rushing damage against Baylor, aside from Murray’s yardage, came late in the game with the Sooners firmly in control. They’ll have to do better against a Texas defense that allows just 115 yards rushing per game.